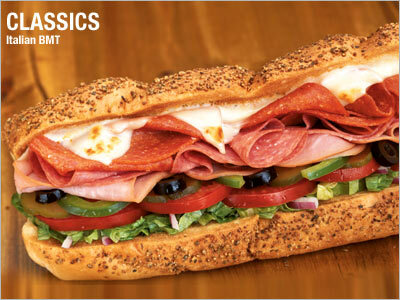 Subway is featuring an oldie but a goodie as its sandwich of the month for July, the Italian B.M.T. This is an offering I bought frequently in the days when Subway first started opening stores in the Chicago area where I live. But it’s also one I haven’t touched since I started paying closer attention to ingredients, particularly to Sodium content. Here’s why. Subway’s nutrition info lists a 6-inch B.M.T. as having 450 calories, which for a lunch isn’t bad at all. But the same 6-inch has 1,500 mgs of Sodium. Double that for a foot-long and you have 900 calories and 3,000 mgs of Sodium. An adult needs only 250 – 500 mg of sodium per day. For people over age 50 and for anyone with high blood pressure, the Dietary Guidelines for Americans recommends no more than 1500 mg a day. In the U.S. diet, processed foods contribute 75 percent of the sodium consumed. The foot-long also has 40 grams of fat and 16 grams of saturated fat, assuming a foot-long’s numbers are double those of the six inch. Subway definitely offers healthy choices, but not everything it sells is totally healthy, so be a discerning diner when you opt for Subway. My choice there is almost always salad with oil and vinegar and a little roast beef. Subway lists that at 140 calories and 450 mgs of Sodium (presumably in the roast beef). Avoid the packaged dressings, they’re loaded with Sodium too.